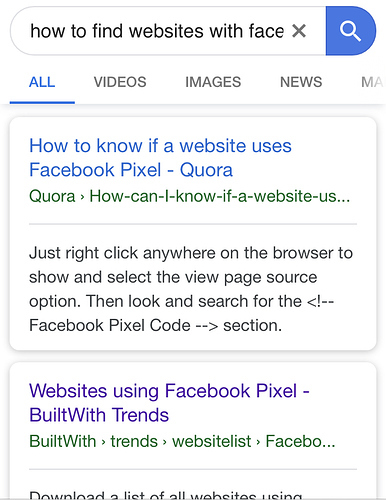 Where and how can I find a list of websites/urls that use Facebook pixel that i can copy so i can paste it into my cookie crawler? Serious question. Do you know how to use google? It’s literally the second result. Life Pro Tip. Take the same question that you have, and instead of asking people to spoonfeed you, put that question in Google. I have already watched that and it cost 300 dollars to get more urls than 50. Why are you so negative? Iam asking about tips that i havent found anywear else, isnt that what this forum is about? Helping people. Not answer with negative intent. Its already two people that wonder the same question above you. Insted of being so negative and hateful you could look up the link and that you posted yourself and see that it cost 300 dollars. Very easy thing to do and you probebly just found the first best thing and posted it just to hate on me hahah like wtf dude. I have looked for hours before i posted this thead and havent found anything for a good price, thats why i created the thread. nope just one. I was watching for this. Thats what I expected to happen. Then tell people where you’ve looked and what you’ve tried instead of an ambiguous question. The best solution I have found is to think logically which are the main websites that use retargeting on Facebook and the answer is e-commerce. A visit to Alexa, most visited websites by sector, scrap the results and bam, you have a list to use.